Bowling for Soup's Inflatable Hook ‘em Horns - No, it's not charity… it's a punk rock band! 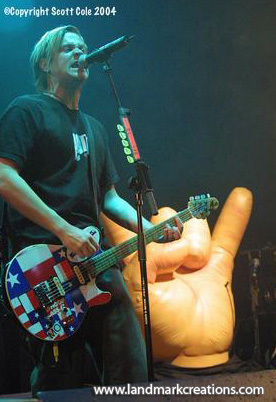 Bowling for Soup used these happenin' hands as stage props during their European tour. Inflatable, easily portable and definitely eye-catching, these hands performed almost as well as the band did. Tradeshows have always been a great outlet for inflatables use. 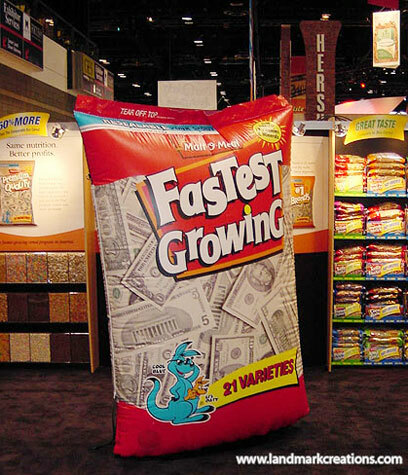 So when Malt-O-Meal needed to draw traffic to its booth at the Food Manufacturing Industry show, they knew exactly what to do. They asked Landmark Creations to design a special cereal bag. Talk about drawing a crowd! 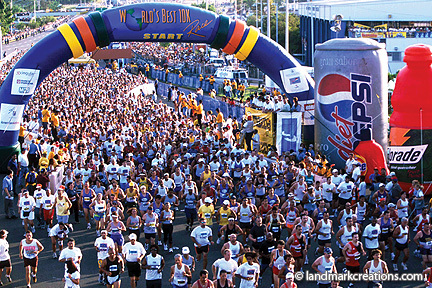 This inflatable arch was the perfect tool for the World’s Best 10K race. A captive audience (those waiting to see who finished and who won the race) had their eyes glued on the arch. Fandango, a special events coordinator, knew that after 9/11 people in general were showing more patriotism. However, people in Washington, DC were particularly prone to flag waving and the like. 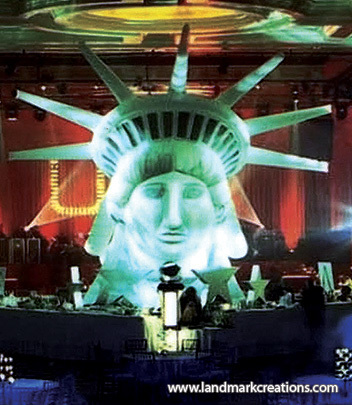 That’s where the idea of the Statue of Liberty head inflatable came into play. A proud sponsor of the Baltimore Marathon in 2004, Under Armour wanted to leave a lasting impression on runners and onlookers. 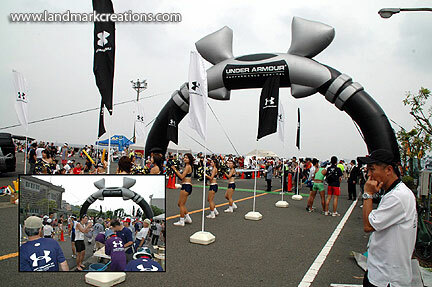 They achieved their goal with this high-tech inflatable arc that drew crowds and helped to boost brand recognition for their apparel line. 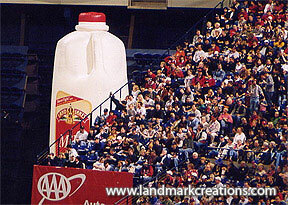 The Minnesota Twins Baseball Team had an inflatable giant milk carton created for use at their games. The carton added interest to the games and also managed to shine a light on their sponsor… literally. Each time a player would hit a homerun, the milk carton would light up with an internal strobe. The fans loved the carton and there was a lot of speculation about just how much milk it might actually hold! Washington DC is famous for many things: One of which is large crowds. On an average day, tourists flood the downtown streets to view the White House, Washington Monument, Lincoln Memorial and other sites. 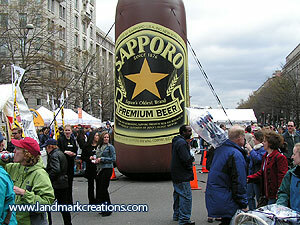 When you add the food and fun of the annual Cherry Blossom Festival, you've really got a pile of people on your hands. How do you draw attention to your product and brand in the middle of all the hustle and bustle? With a 30-foot tall inflatable advertising balloon! 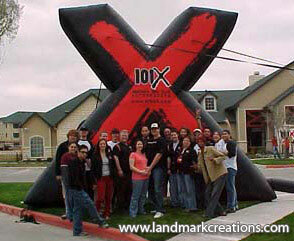 "Everyone here at WFMX 105.7 in Statesville, NC is overjoyed with our inflatable bull. 'Dwight,' as we have named him, really brings something extra special to our radio remotes and appearances. I really should charge for pictures with him- I'd be a millionaire by now! We sometimes fear putting Dwight too close to the road--all the people that stop could cause an accident! Children and adults alike love Dwight. When the Chicago Bears came to Landmark Creations, they were looking for a way to get their brand in front of fans in a strong way. One important aspect of professional sports is marketing yourself and your players well. Since practically all other professional teams (college and high school teams, too, for that matter!) were using an inflatable sports tunnel, the Bears wanted to give it a try.